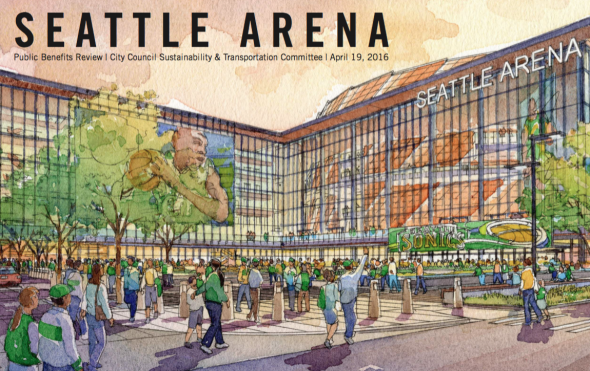 For the Sodo arena, the city council’s transportation subcommittee voted 4-1 to advance the proposed vacation of a portion of Occidental Street to a vote May 2 from the full council..
Cover slide of the Sodo arena presentation by Chris Hansen’s team to the city council Tuesday. Nearly four years after after he made a five-year commitment with the city to build an arena in Sodo and find a team to occupy it, developer Chris Hansen finally scored. He won a city council subcommittee vote 4-1 Tuesday afternoon to advance his project to a full council vote May 2. Enhanced by a PowerPoint presentation from Hansen’s team with a dazzling array of previously undisclosed public amenities as well as capital improvements such as a parking garage and a pedestrian overpass, all funded by Hansen, the decision to advance the vacation of a one-block stretch of Occidental Street was supported by transportation committee chair Mike O’Brien, along with members Tim Burgess, Bruce Harrell and Rob Johnson. Hansen’s PP presentation can be found here. Sally Bagshaw was the lone dissenter, saying vacating Occidental was “a seriously bad idea.” She needs all of the remaining council members — Lisa Herbold, Kshama Sawant, Debora Juarez and Lorena Gonzalez — to agree with her May 2 to stop the process. Perhaps the most unexpected bit of information came from Burgess, who was a signatory to the 2012 memorandum of understanding among Hansen, the city and King County that provided the framework of the arena deal. Burgess explained the council regularly considers street vacations from developers whose proposals claim a public good that requires council verification and approval. Then he flashed a slide of the Seattle map. The Port of Seattle, which has been the most vigorous opponent of the Occidental vacation, claiming that a third sports venue in Sodo would seriously bind freight traffic and cost many jobs, had 32 approved requests from the council for street vacations. The drop-the-mic moment passed quietly in the chamber, because many of the pro-and-con speakers in the earlier public-comment period had departed. But there was no mistaking that some wind escaped the port’s sails. The 32 requests granted don’t reflect on the arguments about Occidental, but they do suggest that the port’s long-held belief that the city has been dismissive of port positions was a tad overwrought. Another primary opponent, the Mariners, were similarly granted a vacation in 1996 for the same street, Occidental, a little farther north, to make room for Safeco Field. Nearly as much a milestone in the process was a vote on nine amendments to the Seattle Department of Transportation’s conditions for approving the vacation. Council members and staff, hearing from opponents recently as the vote approached, tightened and clarified language and responsibilities in the documents. Bagshaw abstained, while the other four council members voted to pass on the amendments to the full council. Perhaps the most important among them was an amendment to strengthen the event-scheduling requirements to reduce the number of days with multiple large crowds. The Mariners, as well as the Seahawks, wrote lengthy, detailed complaints to the council saying that they had no substantive meetings with Hansen’s company, ArenaCo, prior to the Tuesday vote to advance the vacation. No arena event on a non-holiday weekday or weeknight may be scheduled to begin or end within one hour of the scheduled start or end time of any scheduled event at Safeco Field, or CenturyLink Field, or both, if 1) the reasonably anticipated attendance at the arena and one or more of those fields is more than 45,000 attendees, or 2) there would otherwise be three scheduled events starting or ending within an hour of each other at the Arena, Safeco or Century Link. Harrell said that one-hour rule was a “non-starter” with the Seahawks, who called him and apparently insisted on more time between events. The amendment passed, with the understanding that the next two weeks would provide time for further changes. Hansen agreed to pay for a pedestrian bridge ($15 million to $18 million) along Holgate Street to keep fans away from the nine railroad tracks near the proposed arena in Sodo. Herbold is going to be a “NO” (she said as much the other day), but I can’t help but wonder what the 3 other votes in question (Juarez, Gonzalez and Sawant) are ultimately looking for before they’re sold on voting “YES”. Because none of them have really shown any cards yet. Probably just need 1 of them to be Hansen’s friend at this point though if O’Brien, Burgess, Harrell and Johnson are “YES” votes after the process has played out. Seems like real progress is being made on ironing out all the little details. It will be worth it. In Hansen we appear to have a first class citizen who is going to pay a huge cost. Cities everywhere would leap at such an opportunity Seattle has right now. We need NBA and NHL! “Need” is too strong. Seattle seems to have gotten along nicely without either. “Want” is the verb. The public benefits portion of the presentation may be influential among fence-sitters. Mike McGinn said on SOFTY’s show the other day that Sawant was actually a “supporter” of the deal, as hard as that is to believe. So I wouldn’t automatically put her as a “NO” just yet. Wow, that’s great and a surprise. In politics, assume nothing. That’s what got the Republicans in the national mess they’re in. I would imagine there will be some horse-trading going on behind the council doors. IOWs agreement to vote yes on council member pet projects perhaps. All they need to do is swing one council member. Sawant can get cover with the “service related” jobs coming out of the arena being at $15 per hour and maybe she will get support for something that’s important to her. You make a good point on the $15 service jobs it will provide. Many more than what are presently there. I guess by extension it would provided data that $15 minimum wage isn’t a “job killer” that opponents try and argue. Yep, no way socialist Sawant votes yes for a sports arena. Way too much of a bleeding heart to understand the value of an arena. BTW – who the hell votes for less freedom and bigger government?? C’mon liberal Seattleites – you think gov’t knows how to spend your money better than you? Think that will be a talker if it’s 5-4 no? Great article! I am glad someone pointed out some of the things the city has done for the port. The city has a long history of supporting the port and the pending Lander Streer project is another one. Really hoping people look at the facts and focus more on how we can make the Arena happen and keep the port and industrial complex strong. The long-term threats to the port are beyond the reach of the city council and a building project. Yep, as in the Panama canal expansion, which will handle ships 3 times as large as presently and will be completed in May, 2016 (next month!). The falloff in shipping to ALL West Coast ports is expected to be significant. I have always found the line “Hansen wants to bring back the Sonics” quite disingenuous. He actually wants to steal a team from another city or wait for expansion. The proponents come across as somewhat intellectually dishonest. I don’t see how he can bring in an NBA team for come time, yet if there is no arena, that ensures there will not be an NBA team. This venue will be very, very busy with other events, as it is a world class arena, not a 1962 remodel in a very small footprint. If there is an entrepreneur who is willing to risk his fortune, then why not back him? Seen too much of this over the years, both from owners inside this city and in other cities, to think that he is any kind of a cut above them all. Other than “he’s just an all around good guy”, would love to hear anybody’s points on why he is different. These new stadiums are like new cars, the owners get sick of them right quick, and then they ask for a new one. Haven’t heard Paul Allen ask for one since the Clink has been built, and it’s well past “right quick”…. I’m guessing you’ve heard of Stan Kroenke..
Don’t forget pieces of the Kingdome’s ceiling were falling off. You’re missing the point. Remember those glory days when smulyan, behring, allen, they all piled on held the taxpayers hostages with the usual threats of moving away if we didn’t pay for their toys. It happened in St Loius last year, it’s happening in Sand diego right now, and on and so forth. So once again my question, is Hansen any different from these others? Because he’s the developer of the project and surrounding neighborhood? You’re siting teams that were tenants of publicly built stadiums who move on to greener pastures. The LA Rams will be the owners and developers of the stadium and neighborhood. Or probably more accurately, Kroenke will form an LLC or corporation of some sort and then lease the stadium to his other property, the LA Rams. Each situation is different and must be considered on their own merit. The recent LA and SF stadium projects have been privately funded. Not sure about Santa Clara, but within LA and SF they’ve been privately developed. Kroenke was a Missouri native who lied about his intentions, and I don’t blame any St. Louis fan for feeling outraged and betrayed. Just as I have no time for the fraudulent Schultz. But if the character of owners is a big issue for you, then you’re in for a heartache following pro team sports. I’d recommend college FB and BKB except it’s more corrupt. CFB has been my haven but each year my son and I evaluate whether the sleeze factor has become too much. It hasn’t yet but I feel like we can see it from here. Years ago a friend asked me why we spend our money on college sports instead of major league sports (and the greatest athletes in the world in the given sport). This was during the Smulyan years and my response was “you can’t move the University of Washington to Tampa”. Since then we’ve added Anaheim, OKC, etc over the years. I can’t believe the sleaze factor in CFB doesn’t have you coughing and wincing. Constant exposure over the years has built up the immune system. Plus my quilting skills are quite elementary so I haven’t been able to fill the void yet. Then again, perhaps I should move on to HS football with it’s innocence and purity of sport……..Oh wait….. Most of these older stadiums were dual-use FB and BB, so they didn’t work well. They also did not have the amenities stadiums do today – just look at the difference between the overall projects that are Safeco and the Clink compared to the Kingdome: Not even in the same universe. The kingdome was a perfectly serviceable building which would have stood for 200 years or more if they would have let it(Same for the Viaduct, I might add). Granted, it wasn’t a corvette stingray convertible. Someday–probably very soon, Safe and Clink will be obsolete, and the owns will visit the public trough again. I advocated for the Kingdome’s retention. We still don’t have a place to hold another Final Four or a national political convention. Franchise relocation has been a part of pro sports for more than 100 years. Those that don’t understand it’s part of the experience are naive. That doesn’t mean the franchises have no meaningful value wherever they exist. I think Hansen means what he says, and that’s all. He’s neither angel nor devil. Just a businessman with a project loaded with his private cash. You’re free to accept or reject both. The NY Yankees originally started in Baltimore, for example. His demonstrated willingness to scheme and illegally interfere with another municipality’s electoral processes, and then, upon being found out, subsequently attempt to cover it up should be all the info anyone needs to form a judgment about integrity. Do you think it’s possible for a rational adult to learn from mistakes? Anything is possible. He may be your knight in shining armor, but I prefer to be realistic. Too bad you missed what I wrote when Hansen screwed up in Sactown. The Kingdome began to die when the tiles fell in 1994. His plan in 1997 pulled the plug on life support. At least Allen won a statewide vote for his project. He’s from here, and wouldn’t be adding an extra $130M in requested improvements if he was going to be George Argyros, Ken Behring or Howard Schultz. Yes, Hansen’s chances are small to get a team in the five-year window for public funding. But it’s zero without the street vacation, which the port understands well. This is a total crock. He would prefer expansion, but he also has to work with the game that the league gives him. And if we’re making sweeping statements, the arena proposal opponents seem to be wilfully negligent in learning the facts about the proposal. The meaning of “Sonics” is symbolic, and understood by most people. Of course it’s technically inaccurate. It’s a shorthand that conveys the essence. Do you really think the New York Times motto, “All the news that’s fit to print” is accurate? No. It’s aspirational. There’s also being granted the history of a departed team, as with the Browns, Charlotte Hornets, and even the MLS San Jose Earthquakes. If the NBA returns, I can see the new team getting the ’67-’08 Sonics history and stats (Payton, Sikma, etc. ), and OKC reinvented as an expansion franchise like the Ravens. It’s manipulative and plays to the emotions of the Sonics nostalgia. So it prevents rational analyses of these issues. The expression stops no one from thinking. Other things may stop people from thinking. Not that. Ever wonder why the signs that they carry around don’t say “Bring Back The NBA!!” ? You are wrapped around the teensiest semantical axle. Bagshaw just lost my vote. Talk about a small-minded person who can’t see the forest for the trees. Wow. Here is a proposal to increase the property values of the surrounding area, resulting in MORE property taxes, a venue that will generate a multiple of SALES TAXES compared to the Key AND alleviate the nightmare that is the trip to the Key for ANY event (yes, I was a Sonic season ticket holder and it was a nightmare). Presuming the 4 “yes” votes prevail, let’s hope there is one more “yes” vote among the remaining Clowncil members. The 32 street vacations APPROVED by the Port is very revealing Art. It would appear the M’s and the Hawks may be the actual motivators behind the Port’s position, doesn’t it? Bagshaw should just quit now. The fact that Bagshaw doesn’t know how sports works is not a firable offense. Of all the subjects that cross a council member’s desk, sports might be one percent. Her staff should have prepped her better regarding the fact that granting Hansen the right to vacate doesn’t mean he can begin the project. Team first, then shovels. Made her look foolish.. I think what you mentioned last is the issue a lot of of people (at least myself) have with her. I understand that there are issues that need to be addressed regarding the arena, and I’m doing my best to not be myopic just because I’m a huge sports fan. But for her to stick her chest out and make a statement like that while being so ill informed on the issue is laughable. As you said, sports are about one percent of what probably crosses her desk, but shouldn’t you at least have a clue? I heard you mention to Sandmeyer earlier (correct me if I’m wrong) that you believe her initial “yes” to the project was a courtesy vote, which amazingly makes her look even worse. No doubt she whiffed. But I’ve never liked condemning a politician for a single inadequacy. Part of our political crisis in this country is due to one-issue voters. “my room mate Mary Is getting paid on the internet 98$/hr”..,……..!wc320ctwo days ago grey MacLaren P1 I bought after earning 18,512 DoIIars..it was my previous month’s payout..just a little over.17k DoIIars Last month..3-5 hours job a day…with weekly payouts..it’s realy the simplest. job I have ever Do.. I Joined This 7 months. ago. and now making over. hourly 87 DoIIars…Learn. More right Here !wc320:➽:➽:➽➽➽➽ http://GlobalSuperJobsReportsEmploymentsPressGetPayHourly$98…. .❖❖:❦❦:❖❖:❦❦:❖❖:❦❦:❖❖:❦❦:❖❖:❦❦:❖❖:❦❦:❖❖:❦❦:❖❖:❦❦:❖❖:❦❦:❖❖:❦❦:❖❖:❦❦::::::!wc320………. Hey Art, wondering if the power point presentation is posted anywhere on the interwebs. Not at sonicsarena.com yet. Any ideas? Click on 4/19 meeting agenda, scroll down to the bottom and click on presentation.